East Longmeadow, MA –May 16, 2014 – Excel Dryer, Inc., manufacturer of the original, patented, high-speed, energy-efficient XLERATOR® Hand Dryer, will launch the new XLERATOReco® Hand Dryer at the National Restaurant Association (NRA) annual trade show in Chicago, Ill. located at McCormick Place conference center from May 17-20, 2014. XLERATOReco units will be featured at the Excel Dryer booth number 2144, including the opportunity for attendees to enter a contest to win a pair of free, custom-covered XLERATOReco hand dryers. 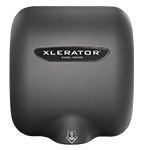 The new XLERATOReco model uses new ‘no heat’ technology to dry hands in 10 seconds* using only 500 watts, making it the most energy-efficient and environmentally-friendly hand dryer on the planet. Furthermore, the Green Restaurant Association (GRA) recently endorsed XLERATOReco as it meets the GRA’s endorsement standard for high efficiency hand dryers, which states that units must have power consumption of less than 1,500 watts and a dry time of less than 10 seconds. If a restaurant installs any of Excel Dryer’s hand dryers from the XLERATOR product family, including XLERATOReco, that restaurant will earn up to 7.5 GreenPointsTM toward becoming a Certified Green Restaurant. XLERATOReco sets another new industry standard in green innovation and sustainability. Drawing four and a half amps or less, multiple XLERATOReco units can be installed on one circuit, which significantly reduces installation costs. XLERATOReco represents a 95 percent cost savings versus paper towels and eliminates their labor, maintenance and waste while creating a more hygienic restroom environment. Additionally, XLERATOReco significantly reduces a facility’s carbon footprint, helping facilities qualify for several LEED® v4 Credits and Green Globes to achieve corporate or government sustainability goals. XLERATOReco has the option to be ordered with a 1.1 Noise Reduction Nozzle or new HEPA Filtration System that removes 99.97 percent of bacteria and particles at 0.3 microns from the air and is the only one with a washable metal mesh pre-filter for reliable performance and extended filter life. XLERATOReco is also available with the industry’s most complete line of optional accessories including an adjustable speed and sound control for sound-sensitive areas, an ADA compliant Recess Kit, the XChanger® Combination Kit – an ADA-compliant paper towel dispenser retrofit kit, MICROBAN® anti-microbial Wall Guards, and custom digital image covers adopted by several companies and organizations including the USGBC Center For Green Schools Green Apple Program, the New England Patriots, Dunkin Donuts, Coca-Cola and many more. Restaurants across the globe have adopted the patented XLERATOR technology including Move Tim up here first then Tony, you should write a sentence about Max’s Restaurant Group i.e. 10+ high end restaurant concepts in CT and MA including its newest concept Max Burger, add explanation, etc. then get into Tim’s quotes etc. Tony Guiggio, owner of a Massachusetts-based Family Restaurant. “From labor, maintenance and waste removal fees to the cost of purchasing and replacing paper towels, our restrooms were a significant cost center. XLERATOR hand dryers not only provide a significant cost savings, but they are also better for the environment. XLERATOR is a real win-win solution for business owners and we are thrilled to have installed XLERATOR hand dryers in all of our restrooms,” said Guiggio. 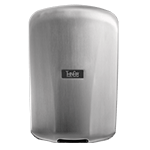 Excel Dryer is the manufacturer of the original, patented, high-speed and energy-efficient XLERATOR® hand dryer. Patented XLERATOR® technology completely dries hands three times faster (in 10 seconds*) while using 80 percent less energy than conventional hand dryers. 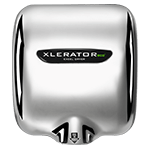 XLERATOReco® hand dryers’ new “no heat” technology dries hands in 10 seconds* using only 500 watts, one third the amount of energy used by XLERATOR®, making it the most energy-efficient and environmentally-friendly hand dryer on the planet. Drawing a maximum of four and a half amps allows for up to three XLERATOReco® units to be installed on one circuit, significantly reducing time and costs of installation. Both units represent a 95 percent or more cost savings when compared to paper towels, eliminates their maintenance and waste, while creating a more hygienic restroom environment. Excel Dryer manufactures the only hand dryers that are Made in the USA Certified®, the first to be GreenSpec® Listed and also help facilities qualify for several LEED® Credits and Green Globes to help meet corporate or government sustainability goals. A peer reviewed (per ISO 14040 standards) Life Cycle Assessment of XLERATOR® confirmed it reduces the carbon footprint of hand drying by 50-70 percent when compared to both traditional hand dryers and even 100 percent recycled paper towels. XLERATOR® and XLERATOReco® can be ordered with a 1.1 Noise Reduction Nozzle or our new HEPA Filtration System with a washable metal mesh pre-filter for reliable performance and extended filter life. Excel Dryer hand dryers are now available with a full line of accessories featuring a sound and speed control for sound sensitive areas, ADA compliant Recess Kit, MICROBAN® antimicrobial wall guards, the XChanger® paper towel dispenser retrofit kit and custom digital image covers. The Green Restaurant Association is a national nonproﬁt organization that provides the only ofﬁcial Certiﬁed Green Restaurants® mark in the country. For 23 years, the GRA has pioneered the Green Restaurant® movement and has been the leading voice within the industry encouraging restaurants to listen to consumer demand to green their operations using transparent, science-based certiﬁcation standards. With their turnkey certiﬁcation system, the GRA has made it easy for thousands of restaurants to become more environmentally sustainable in a proﬁtable manner, in areas such as energy, water, waste, chemicals, food, building, and packaging. Each Certified Green Restaurant® earns at least 10 GreenPoints™ in each of the following: energy, water, waste, chemicals, food, and disposables. Excel Dryer’s Green Restaurant Association-Endorsed products earn 7.5 GreenPoints™ in energy, helping restaurants get 75 percent of the GreenPoints™ they need in energy to become a Certified Green Restaurant®. The Green Restaurant Association helped to found the green business movement in 1990 and now has restaurants in 47 states and Canada. In of 2014, GRA greened the first football stadium, helping MetLife Stadium become the first Certified Green Restaurant® stadium in the world. 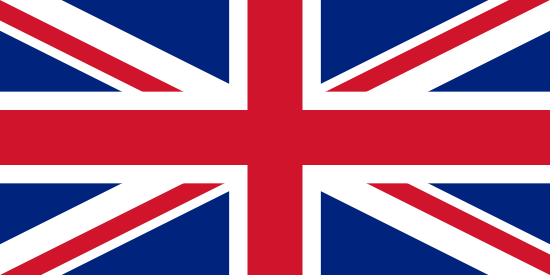 The GRA also greened the 2014 Super Bowl. The GRA has been featured in hundreds of media outlets: CNN, NBC Nightly News, NPR, New York Times, The Washington Post, Politico, CBS News and more.